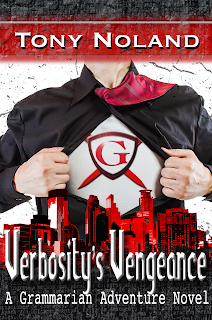 I'm over at Cathy "Ganymeder" Russell's blog today, being interviewed and talking about "Verbosity's Vengeance" - what it's about, why I wrote it, does the Grammarian ever speak in the vernacular, advice on publishing, etc. Go check it out! Reminder: "Verbosity's Vengeance" comes out Monday!